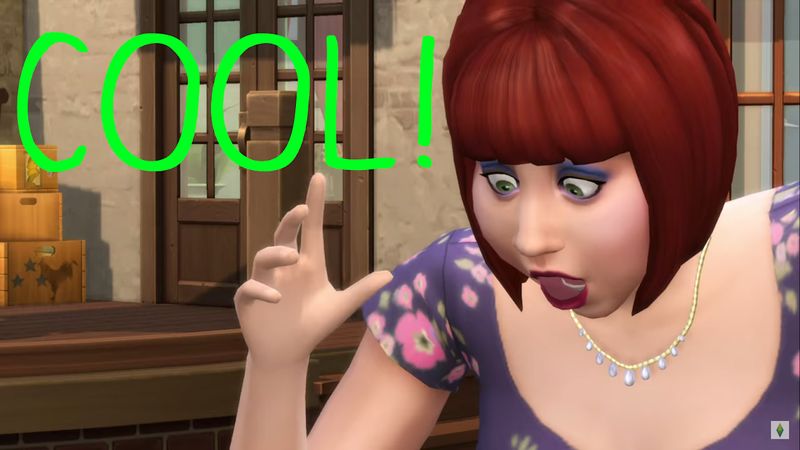 For once The Sims trailer could not be more on point (just kidding), and unfortunately it is here with The Sims 4 Cool Kitchen Stuff. Released on August 11th, 2015, the pack fails to deliver its own title...mainly with the kitchen part, but the tack cool also falls into this realm. The pack comes with two new counters (one regular and one island) of the same style, and they are notably similar to the counters we already have. But the trailer conveys these same counters in as many colors are on the color wheel to make you think you're getting so much new cool stuff! Beyond the counters come some new clutter, some hair and clothing, and that's about it! Really, this isn't a joke or a bash on EA. That's it! Okay, well there is one main redeeming factor the pack brings. There is a new ice cream machine which brings some cool new features, but for $10? Is an ice cream machine really the kitchen item which names the pack? I mean you could have added some cool new gadgets or trinkets with other functionality to fit the theme, or at least added a few different counters to fit the theme! But that is not what you get. You get a whole heap of ridiculousness. I mean, it's not even that EA is milking this cash cow...it's that, why couldn't you gently pull the utter instead of violently squeezing until drawing blood? Do it right next time EA! And if you're going to release a pack with a bunch of clothes...name it appropriately. But nice ice cream cone drop. Way to draw attention away from the lack of Kitchen.